That's exactly how I started. I never made the conscious decison to start "collecting". I was just fascinated with the Great War and one day many years ago I saw some medals for sale and was absolutely mesmerized by finding out the the history behind them. A man who had fought in Great War owned these medals -whether he hated those medals or loved those medals, they were a very personal tangible link to days gone by. I thought "who was this man, what did he see, how did he feel, what happened to him after the war, did he have a happy life in the end, why are his medals for sale...?" Then I bought some more and ...... my god then I became a hopelessly addicted collector. Other collectors will know exactly what I mean. There is a wonderful comaradie and sharing of information amongst us. For those that like this stuff the British Medals Forum is excellent. Apologies for contributing, I felt as though I must, I don't know why other people collect medals, it's non of my business. I do object to people making sweeping statements which in my case and most probaly a lot of other peoples, are so far from the truth that the person making them is also making a fool out of themselves. I have been collecting medals for a lot longer than some people on this forum have years on this planet. I consider myself a very fortunate custodian of the items in my collection, and try very hard to gather as much information about the individuals as I can, not out of self gratification or profit, but to try and keep the memories of these men available to anyone who is interested. I am under no illusions that if I had to sell my collection then I would have no choice, at this stage I have never sold anything that I have bought, though I have swopped a couple of items to collectors who "needed them more", I do fully understand that medals have been sold in the past by owners and families out of sheer desperation, I have a pawn ticket from Gateshead dated 1924 for "one Military Medal", the fact that I have the ticket proves that the man who earned the medal could not redeem it. I sincerely hope that my grandson will be interested sufficiently to carry on where I leave off. So I ask those that don't understand, try to do so. If you feel so thin skinned about it - just don't bother reading the thread; let alone putting sarky comments on it. If no medal collectors had ever come forward to express their views and explain their various personal reasons for collecting, and their interests in the associated history, would you have changed your opinion if the only views expressed collectively and repeatedly denigrated the collecting of medals? Views by sincere Great War medal collectors as posted in the GWF have shown that there is a difference between collectors and dealers. My opinion changed literally with the possesion of those two French medals, and the wish to find out more about the original owner. Yes, my opinion would have changed if the views posted here were only one-sided and denigrated collectors. I'm not easily swayed by argument, and tend to depend on personal interpretation/experience in formulating a view. A bit like King Canute! My last comment is concerning something which irks me in whichever subforum, when a member denigrates the argument as old hat, or points immediately to another thread. Not very polite. Views by sincere Great War medal collectors as posted in the GWF have shown that there is a difference between collectors and dealers. You hit the nail on the head there. There is a vast, vast difference between collectors and dealers. Dealers do it for the unattached profit and collectors do it for the sheer interest and admiration of contributing to a small piece of history. Think of the amount of history that would have been lost if there were no medal collector's. Think of the amount of history that would have been lost if there were no collector's of anything. A general point must be remembered when discussing this subject. One of the reasons that the WW1 Soldier fought was for freedom of thought,expression and decision. It is, therefore, wrong of any of us to criticise a Medal Collector/non-Collector or Dealer who is merely exercising a freedom that was so hard fought.Or question the reason a man or his Family chose to sell,give or throw away personal Medals. If I have any concerns on the subject it is the attempt to lionise Men,who fought,in WW1.I prefer to think of my Uncles,as an example, as honest men,who did their duty as they saw best, not seeking glory but trying to give of their best,in all circumstances.I'm sure they had flaws but never had the opportunity to display them and those who knew them,if they ever talked about them,would portray their strengths never their weaknesses. As a people we,to my mind,seem to look back on History,with rose-coloured spectacles.Emphasising the good but don't really appreciate the reality. This is a WW1 Forum and it is right that we emphasise the importance of it in History but in the scheme of things how important is it to today's generation? reflect that three of those medals were originated in UK I believe. Everyone is entitled to his opinion, but I would wish two things. Look up the definition of a campaign medal and two. If a collector had an opportunity which medal would you buy a medal to Pte Smith or a medal to FM haig ? Think about it. I will be away for a couple of weeks and I wish everyone a Merry Christmas and a happy New Year in 2010. It should be noted that even in these times families sell their kins medals, just watch real deal or cash in the attic etc. They dont neccesarily need the cash they want a holiday!. So if a dealer or collector buys them so what. I sit and scream at the TV dont sell your bloo*y families history. But they do, if it wasnot for the collectors market Im sure it would be for the scrap silver. Sad but thats life. As yet Ive not managed to reunite a trio, but recently united a plaque to a victory, and paid over the odds to do so. That is one of the good things about the internet is it increases the search possibilities for these elusive orphans. I understand your point, George, but it is not entirely true. A good many fought because they were compelled to do so. Not being a medal collector myself I ask this (possibly naive) question. Does whether a man was a volunteer or a conscript affect the monetary value of his medals today? Is there more in having a pair to a man who volunteered in 1914 but for some reason did not go over until 1916, than to an 18 year old who arrived in France in November 1918? Like you,in answer to my post I,appreciate your thinking. It would be very easy for me to list the Family Medals I possess.Trios belonging to pre-War TF,whose Battalion was in the front-line by 22 November 1914 and participated in the Christmas Truce. I suppose price is determined by the Collectors own desire,to add a particular set of Medals to his collection. George makes a very good point about lionising the men who served. I think there is a tendency to do so, especially amongst those who have a keen interest in the conflict. They weren't all heroes and many did the bare minimum that they could. I'm sure there were shirkers, malingerers and every other type of man taking part. There were doubtless many bullies amongst the officers and NCOs in every army. That isn't meant to belittle the sacrifices that were made, nor the lives that were lost. They weren't a golden generation, they were simply a complete cross-section of men who did what they had to do. In many ways, that makes them more interesting. I have researched men who were disciplined for various 'offences' which often boiled down to how they could, or couldn't, cope with what was asked of them. But, the bottom line is that they all had a very much harder life than I have had and the vast majority "did their bit", whatever their motivation. They all have my respect. Not being a medal collector myself I ask this (possibly naive) question. 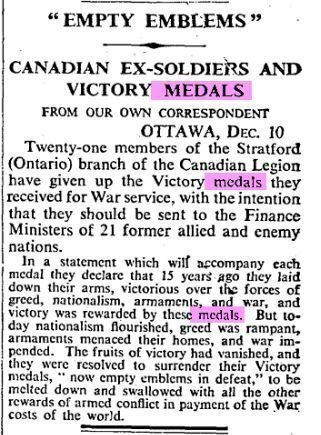 Does whether a man was a volunteer or a conscript affect the monetary value of his medals today? Is there more in having a pair to a man who volunteered in 1914 but for some reason did not go over until 1916, than to an 18 year old who arrived in France in November 1918? I'm sure there were shirkers, malingerers and every other type of man taking part. There were doubtless many bullies amongst the officers and NCOs in every army. Interests:WW1 AIF infantry battalions - all 60 of them. Often go to the battlefields to research where they fought and died. Also very interested in recovery of our war dead. When I bought my first WW1 medals I just wanted some from the infantry battalions of the AIF. It was only after I started mixing with other collectors that I realised everyone has a "theme" to their collection. Mine is AIF infantry but in the UK it is common for people to only collect a specific regiment. In Australia it is common for collectors to collect just a single battalion or brigade or division. Others collect only a particular surname or only gallantry medals or only KIA/DOW sets. A common one is those from a particular area. Some will only collect single medals or only pairs or only trios. Others will collect POW's or those of a certain rank. I have always been amazed by what people collect and how specific that collection is, whether it be medals or Zimbabwian beer coasters. This in the end can create a huge expert knowledge bank. But I am equally amazed at the sheer passion us collectors have for our field of interest. Merry Christmas to all on the forum. P.S. I have a small register of broken AIF medal sets on my passionate website www.1staif.info and if you have an AIF medal set that is broken I list this for free. Try explaining that to my wife! It seems that "Dealers" are now to be tarred as the New "Collectors",what must be recognised is that without Dealers there could be no Collectors,As Collectors, we rely in the main; on Dealers in some form or other; be they full time & highly professional as with the leading Auction Houses,World Renown Dealers of many years standing,to Part time Dealer / Collectors who deal to fund their collecting all have an abiding interest in the items they sell,I doubt many of us would be able to establish much of a Collection by relying on accessing Medals from private sources? ?,The majority are sourced via a Dealer of some description,wether a general "Bric a Brac" dealer at the local Car Boot sale or a West End Trip to an Auction House. The two are intertwined irrevocably if you are a serious collector of anything you need dealers. I have collected now for over five years so am still pretty new to this,I have around 120 Great War medals mostly single BWM's to different regiments to all sorts of ranks,in my view every one of these men have a story behind them and I would never consider selling any.To the original question I myself find it disappointing to see broken groups but would have to agree with the posts that have mentioned many reasons for groups and trios to be broken.One thing that sickens me though is to see groups been broken up on auction sites for monetary gain,even though these sellers are free to do what they wish with these medals I think it shows little respect. Good man - well said. They were my original thoughts. If I were a Collector of Medals,and bought a single Medal,did my research and found that the recipient was entitled to two,if not three,I would be disappointed,and would strive my best to find the other one or two.Whether to add to my collection,or to give to a descendant,who seeks a link with forebears,I cannot help. As has been pointed out earlier,in this Thread,Men by accident, chose,or were forced to fight,in WW1. I am still of,the opinion,that one,two or three Medals,does not give an insight,into the man,other than research may reveal his Regiment,where his Battalion was stationed,and indeed his misdemeanours,or reasons for being discharged,if not killed. Some times groups get broken up on flea bay because the seller thinks he can sell the group easier if in 3 small bits .It does make you wonder though ..would not most think its worth more as a set than broken up.